Since 1875, when the members of the Fitchburg Sportsmen's Club first met, sportsmen have been empowered to carry out their 4 Point Action Program: Legislation, Conservation, Public Relations and Education. Since 1875, as sporting clubs have grown and multiplied across the state, the Worcester County League of Sportsmen's Clubs has embraced and broadened the impact of the Action Program, whereby all member clubs including the oldest in the country (Fitchburg Sportsmen's Club) are part of the ongoing effort. The WCL reaches out to the public by attending several Central MA sportsman events and shows. In this photo is LA Jones, League Treasurer, raising awareness of the WCL programs and raising funds with the annual raffle. The funds support our many programs including the 3 scholarships for the Junior Conservation Camp. Members of WCLSC serve as advisory to MA State Legislators, MA Division Fish and Wildlife, MA Division of Conservation and Recreation, and other state organizations with common interests such as Mass Conservation Alliance and GOAL. WCL does advocate a common voice for the league, whereby we represent over 50 regional sportsman's clubs with aggregate membership over 25,000 outdoorsmen. We participate/present in public hearings, attend meetings, and provide position/viewpoints during open comment periods. Several examples for 2018 have included support of the CrossBow Legislation Bill, the WMA Dog Leash Regulations, the Expanded Archery Season for Zones 10-14, and Nashua River Watershed becoming part of the Wild and Scenic River Program. 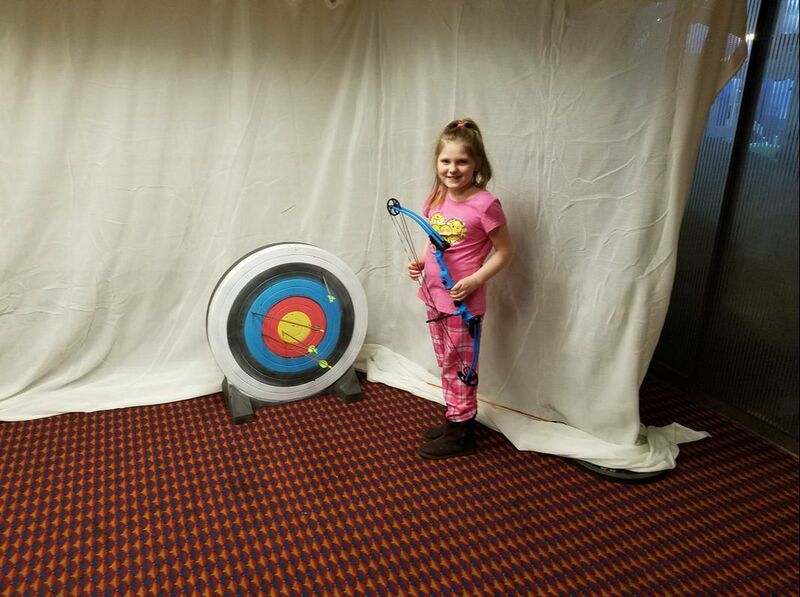 Young shooter hits bulls-eye at annual New England Outdoor Sportsman Expo, where each year the WCL sets-up an indoor archery booth.